What They Call Games: PlayStation All-Stars: Controls, Attacks, Gameplay as Compared to Smash Bros.
PlayStation All-Stars: Controls, Attacks, Gameplay as Compared to Smash Bros. In Super Smash Bros., you win by attacking and trying to knock each other off the stage. The more damage a player incurs, the further they fly when hit. You can either play under a time limit for the most kills or a survival match with a limited stock of lives (and there are also several other modes that are more unique but less played). 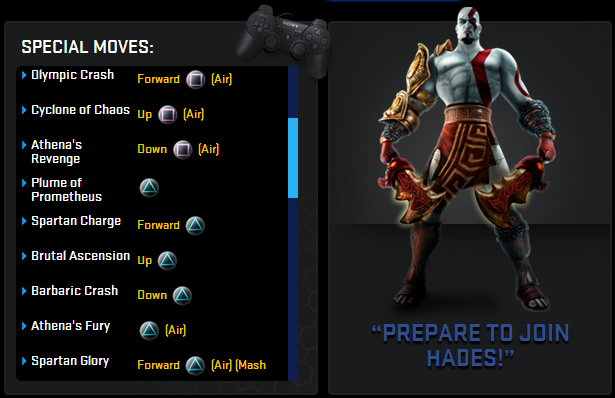 In PlayStation All-Stars, dealing damage increases your AP meter which you use for special attacks. The specials have three levels, and you can choose to use your special whenever it's filled up to at least level one; a level three special attack is best, but takes longer to charge. These specials are the only way to kill your opponents, so the goal of the game is to charge your special, use it to kill the other players, and get the most kills. There are special attacks and normal attacks, which are used by pressing a direction and B or A, respectively. Normal attacks can vary based on: being in the air, being on ground, whether you tilt the control stick beforehand as opposed to mashing it simultaneously (which results in a chargeable "smash attack"), whether you're running or not, and of course, which direction you attack. Special attacks usually just vary by direction, but tend to have more unique effects that are especially unique to each character. There are also grabs and throws, which vary by which direction you throw your opponent. For dodging, you can either hold a button to shield, which will protect you from attacks except for grabs, or you can roll side to side or dodge in place, which grants you a second or less of invincibility. These simple button plus direction controls make it so there's a good variety of moves but also so that these attacks are easy to remember and execute quickly. The challenge then comes in learning how to use each move effectively and knowing the details of how each works; one character's forward throw may be far worse than their backward throw, and some moves do more damage or give greater knock-back if they hit in a particular place. The official website provides a move list for each character. In PlayStation All-Stars, the attacks are performed similarly, except there are three attack buttons which can be combined with a direction. A few of these perform differently when in the air, but not all. Also, there are no "tilts" as there are in Smash Bros.. Also, there don't seem to be any "sweet spots" for landing attacks. A hit is a hit, and it doesn't matter where you hit. There also aren't any different attacks performed when running. In fact, there really isn't any running at all, and for the size of the levels, movement feels slow. Throws, of course, are also in the game, but you can only throw in three directions (you can't throw backward), unlike the four in Smash Bros.. These throws are performed using the right stick, which ends up being a lot more awkward than using a button. Shielding works much the same way as in Smash, but there is less of a visual cue when you are simply guarding and the opponent still builds their AP meter a little even if you guard (but not if you dodge). Unlike Smash Bros., PlayStation All-Stars, does not allow you to dodge in place. Another thing to note is that there are a few items that you can pick up and use during the fight. There will be an option to turn them off for those who want to, but something I noticed from playing the beta is that the items are very awkward to pick up. Not only do you have to be standing right on top of the item, but it also seems to take a longer than expected amount of time to pick the item up, which usually results in you being knocked away. While I like that there are three attack buttons and I think that the goal of killing with supers is fun, I couldn't help but feel like this game's controls just weren't as tight as those in Super Smash Bros.. It isn't anything major, but the little things add up to a feeling that it could have been more polished. Whether it's the inability to run at different speeds, quickly change direction while running, fast-fall, the hard-to-follow character models, unclear guarding animation, and clumsy grabs and item pickup, PlayStation All-Stars just doesn't give the player the control that would have been ideal for such a fast paced and chaotic game. Don't get me wrong, I'm loving the beta and think it's a blast to play, but there are some subtle improvements that would have bee nice. It's too soon to say whether character balance will hold up or how the rest of the game is, but I'm interested to see how it will fare with competitive gamers when the full game is released on November 20th.